Soft Hake brushes make very expressive strokes when used with encaustic paint. Quickly lay down broad, smooth strokes, or use them to build up textures and layers. 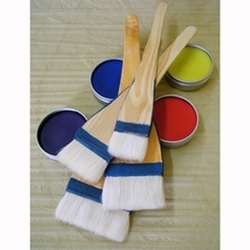 These brushes are made from goat and sheep hair with nice sturdy wood paddle handles.